One thing I can’t stand is people making immediate judgements or conclusions about someone based on how they look, how they dress, how they talk, etc. I know I’ve been guilty of this, we all have, right? I’ve always been pretty quiet, a natural introvert, but since I spent much of my life on a stage, many people have interpreted my quiet nature to be arrogance sometimes. It obviously was quite the opposite. I used the stage to come out of my shell and at times be someone different, then afterwards, if you know anything about introverts, I would need quiet to recharge. On top of that, I’ve always been fairly shy so putting myself out there to be social was a huge stretch for me. About 12 years ago I was sent to a management ‘retreat’ where we took the Myers Briggs test to help us decipher our personalities and adapt them to a style of management. The very first component tells you whether you are an introvert or extrovert. What they, and I, found interesting is that I came out exactly in the middle. After speaking to my assigned mentor, he told me that I am a natural introvert but since I had been in sales so long, I had become a forced extrovert…interesting. So, I am still in sales, in a new job, most of my customers are men, but most of the support staff are women. Who is worst and immediate about judging…a woman. Let’s face it, we women are hard on each other. I see it even with my daughter and her age group, girls can be rough at any age. This week I was in one of my offices and the office manager (a woman), just stared at me with disdain on her face as I spoke to a customer (a man). After he left, I tried to engage her in normal conversation and she wasn’t budging, so what did I do? 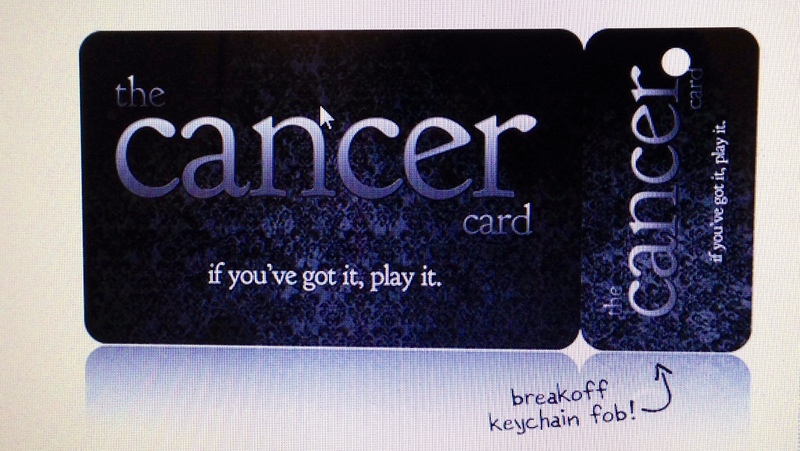 Something I hardly ever do…pulled out the ‘cancer card’. That’s right, I mentioned that it had been hard to maintain a job in a shrinking industry all while fighting cancer off and on for 5 years. Can I tell you her demeanor changed COMPLETELY! The last time I pulled out the cancer card was a few years ago when I still had a bandage over my neck covering my stitches and a guy cut in front of me in a line at a shoe store. I had been waiting awhile and he literally jumped in front of me because he said he was in a hurry. I looked at him, smiled, and said ‘Dude, I have cancer.’ I know, crazy, but I was in line first. Anyhow, this office manager let me say what I needed to say and afterward actually complemented me on how I was the best sales rep she had seen in a while and that she appreciated my intelligence and humility while talking about my products. Wow, really? Again, I hate that. Why are people nicer to me after I say I had cancer? By the way, you can actually order a cancer card from Stupidcancer.org. The pitch is to cash in the pity chips and milk the diagnosis for all it’s worth…so funny. But really, why can’t we all just be nice from the get go? Two great lessons for me after cancer: Life is short, and everyone has a story. We are the way we are from a combination of our personality and experiences. I love listening to people’s stories and getting to know what they’re about. Think about it next time you make a judgement call on an appearance before you actually speak to someone, you may be surprised. Today I wear It Cosmetics Vitality Lip Flush in Pretty Woman. This product is very cool. They describe it as a lipstick/lipstain/lip balm/lipgloss, rolled into one. I know it sounds impossible, but it’s kinda true. The texture and color are great. I have to say it’s a little more of a stain then a lipstick but it still adds great color. Pretty Woman again is red…yes, still on the red kick. I love it! Til next time, cheers! Go Anna! From one adapted introvert to another, I completely agree. “Extros” rarely understand the energy required for “Intros” to function in an extroverted world, and the judgement doesn’t help. So glad you played your card 🙂 – you’ve earned it! Thanks Grace! I think I may use the card more often! Hi, Anna. Jumping to conclusions of others without knowing all the facts causes an immense amount of pain in this world. Dealing with health issues most of my adult life, even though not as serious as yours, has taught me to think twice before judging others. I have learned the hard way that things are not always as they appear and unless you have walked in someone’s shoes don’t be too quick to judge. Nice post. Thanks Kat! I think most of the time things are not what they appear!